Last night was the WWE Royal Rumble pay-per-view event. I am a huge WWE fan, so there’s no way I’m missing the beginning of the road to Wrestlemania. I am not here to talk about the entire show, just the main event itself. 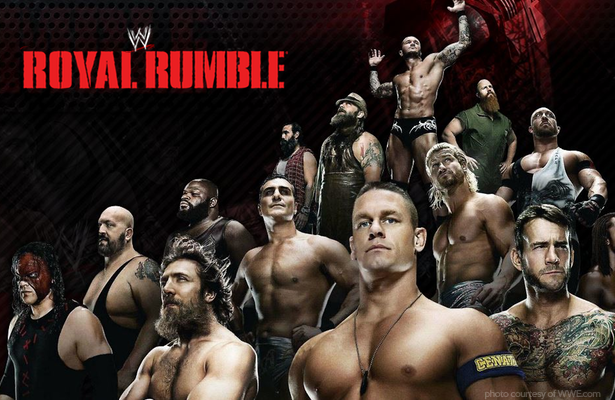 For those who don’t know, the Royal Rumble is a battle royale style event with 30 competitors fighting to be the last man standing. I watched with a group of friends, and we recently started a tradition of betting on the match by drawing numbers from a hat. I pulled numbers 1, 2, 9, 19, and 21. We already know from an incident with Kane on Monday Night RAW that #1 is going to be CM Punk. So how did the Rumble shake down? CM Punk- Yes! A very likely candidate to win it all. He has both the cunning and the stamina to outlast everyone. Seth Rollins- Also a solid draw. I wouldn’t expect him specifically to win, but we all know the SHIELD are pretty much unstoppable when they’re all together. Plus, I love his athleticism. Damien Sandow- No comment. I don’t know why this guy is still around. Cody Rhodes- Fresh off of his loss of the tag titles at the start of the night, too. I expect to see him and his brother feud over the loss up until Mania, which should be AWESOME! Kane- I was glad to see him enter and I thought maybe he would break Shawn Michaels’ record. But then he got eliminated before ever eliminating anyone. Lame! Alexander Rusev- To be honest, I do not keep up with NXT, so this refrigerator of a man was not familiar to me. His future as somebody’s muscle looks pretty clear to me, though. Kofi Kingston- I’m such a huge fan of his. It’s frustrating to see him stay barely a step above jobber. Jimmy Uso- WOOOOO! I got the cute one! I can’t wait for him and his brother to get a tag title run! He won’t win today, but I’m hoping for a good show. Goldust- He’s already had a huge year to me. I was just surprised to see him get back in the ring in the first place. It’s true though, this is the best shape he’s ever been in. Dean Ambrose- Grr… I respect the mic skills but he’s got a lot of growing to do. Dolph Ziggler- Surprise! He’s alive! R-Truth- I find him entertaining. Solid mid-card man. Kevin Nash- Surprise! He made it all the way in and out of the ring without hurting himself! The man was hilarious at ACCC, though. Roman Reigns- I’m concerned that this guy will never be able to stand on his own. He’s always going to need a mouthpiece. I hope he works on that. Sheamus- I knew he’d be back! YESS! Now to see if he’ll be the hilarious face or the monster heel. Either way, it’s good. The Miz- I’m not saying he doesn’t have SOME in-ring ability, but I swear he needs to just move on to the commentator stage of his career. We all know he’s going there. Fandango- Ugh… what a waste of a draw. I know lots of people like this guy, but I just can’t buy this character. El Torito- I find it hilarious that the mascot gets a spot in the Rumble and Los Matadores do not. Go back to being Puerto Rican, gentlemen. Antonio Cesaro- Not a fan, but I respect the skills. At least I know he should last pretty long in the match. JBL- Surprise! But I have to be disappointed. When are the commentators going to start wearing break-away suits for this match!? Erick Rowan- Actually, I think this one is the less creepy of the two. Ryback- Another one that I had almost forgotten about. Alberto del Rio- He made a lot of noise going into the Rumble, but I really wasn’t expecting any big contributions from him. Batista- Ahh, the one everyone has been waiting for, except not really. I was excited to see his return, but he seems to only be a shadow of his former self. Big E Langston- Someone, PLEASE explain to me why this guy is IC champion? Rey Mysterio- Wow… this is the flattest reaction I think I’ve ever heard at a pay-per-view. I love Rey, but it seemed like by the time #30 came around, nobody was looking for him. Of course, Kofi had his show-stopping moment when he jumped from the barricade back onto the apron. It turns out I had a pretty good selection of wrestlers since most of them were still in the ring well after all 30 entrants had joined. Then disaster struck, and 3 of my guys were eliminated within 30 seconds of each other. The final 4 were Punk, Batista, Sheamus, and Reigns. No shock there. Of course, Batista wins. I’m out $5, and I’m not sure the right man won this time. He was number 28 and by the end of the match he looked winded and worn out! You just got here, why are you tired? I would’ve much rather seen Punk or Sheamus win, or Daniel Bryan as a contender. I guess we’ll see what happens on RAW tonight. I miss Undertaker. Don’t you?